Not just his invoices, but those of two colleagues who had recently been promoted to Cookie Cutters at the candy mills. There they would no longer be met with endless paperwork, but the heavenly wafts of gingerbread, cinnamon, vanilla, chocolate, and every tantalizing flavor in Kringle creation. Every day, someone new managed to escape the Abominable Administrative Department for more magical pastures, and it had become a sort of temporary stop for newly graduated elves on their way to something better. Tim wished he were one of those elves. In fact, he spent a great deal more time than he should daydreaming about all the exciting possibilities, imagining all the jolly adventures to be had outside of filing and typing. Then he remembered why he was one of the only elves never to move on from the AAD. It was the only thing he could do that didn’t require some kind of flair or unique talent. He wasn’t creative or coordinated enough to work in Mayor Kringle’s Construction Firm. He didn’t have the ability make toast, much less possess the skills necessary to work at the candy mills. He wasn’t ridiculously handsome, brave, or special enough to be one of the Rein Dear Squadron—then again, few were. He wasn’t hardboiled enough to be one of the Frost King’s toy soldiers. Heck, he couldn’t even cut it as a Ribbon Curler in the Gift Packaging Plant. It seemed like only yesterday Mr. Kringle had assured Tim he would find his calling like everyone else. After all, he was still quite young, barely into his two hundred and forty-fifth year. But most elves found their calling by the time they were one hundred and fifty, and out of Claus College. The only reason Tim was even a part of Mr. Kringle’s organization was because of Tim’s father—something that hadn’t gone unnoticed by everyone who met him. At least they all respected his father enough not to discuss it. Either that, or the pity they felt for Tim surpassed the desire to gossip. Holding back a sigh, Tim gathered up the latest mound of completed invoices and grudgingly carried them toward the banged-up old cabinet, the one that should have been replaced decades ago. Almond bark would have made a sturdier alternative to this thing. Tim leapt into the air, his heart pounding fiercely in his chest from the unexpected fright. Around him the invoices drifted like falling snow, and the office erupted into laughter. Taking a deep, steady breath, Tim crouched down to pick up his paperwork, ignoring his supervisor, who loomed over him with a smug grin. He hated when Noel snuck up on him like that. Of course, if he stopped daydreaming, maybe Noel wouldn’t get the drop on him so often. Tim grunted noncommittally as he continued to gather the stray sheets. “Is there something you needed?” He tried not to let his irritation slip into his tone. The last thing he wanted was to give Noel an excuse to pile on more work. Tim had no idea what he could have possibly done to make the dark-haired elf dislike him so much. When Tim had first joined, Noel had been nice to him, had smiled and even held pleasant conversations with him. Now he went out of his way to avoid Tim, only interacting with him when it was absolutely necessary, and even then it always resulted in an incredibly unpleasant experience for Tim. Noel’s size and intimidating disposition didn’t help any, especially for an elf as small as Tim. Noel was the tallest elf in the AAD, broad shouldered, a few years older than Tim, and could actually be mistaken for handsome if he didn’t look so miserable all the time. 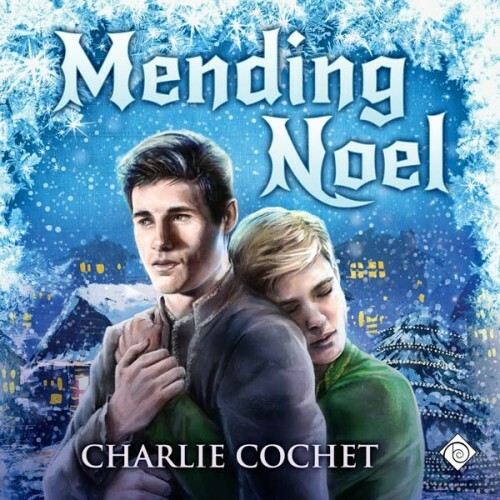 Tim couldn’t remember when it had happened, only that one day, out of the snowy blue, Noel stopped smiling at him, and had begun giving Tim a much harder time than the rest of the elves in the office. For the life of him, Tim couldn’t figure out why. There were times when he wondered if maybe Noel had found out about him…. Quickly, he shook that thought from his head. No, no one at the office knew. If Noel had known, and that was the reason for his hostility, then surely he would have confronted Tim about it by now. Instead, he tormented Tim every day from morning until the end of the work day. “I know. I haven’t forgotten,” Tim grumbled, attempting to blow a stray lock of hair away from his eye while trying not to drop everything again. “Here, let me help you with that.” Noel leaned forward and Tim went stock still. He didn’t even get a moment to contemplate what the heck Noel was about to do—or even a chance to run for the hills?before Noel swatted the papers out of his hand. They both stood watching the flurry of foolscap float to the floor all around them. Bah humbug. Again. “Darn my clumsiness. Well, at least now your hands are free.” Noel grinned as he walked away, joking with some of the other elves about Tim’s clumsiness. 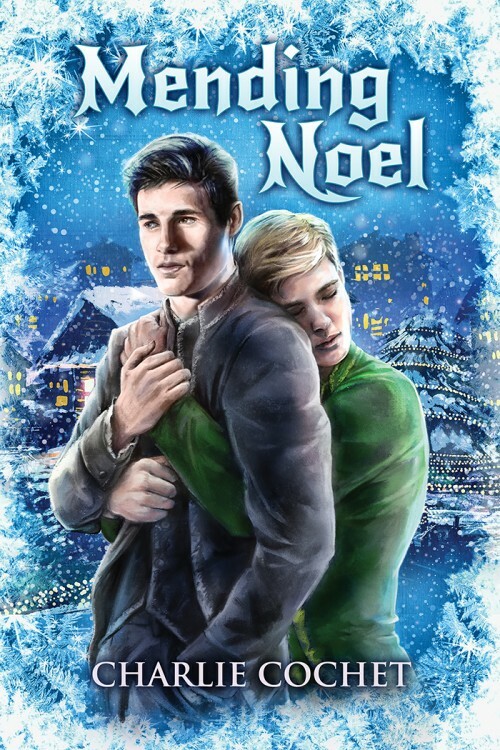 No one came to help him, and even if someone did want to, they wouldn’t dare do so with Noel around. Tim couldn’t really blame them. The last thing he wanted was to be the cause of someone else’s misery. Once he had collected every piece of paper, he spent the rest of the afternoon filing them away. Not even the bells on bob-tails ringing in the background could make his spirits bright. As usual, when evening came, he was the only one left in the office. With a groan, he let his head drop on his desk. How had his life turned out this way? Not only had his father been blessed with great magic, he had been one of the most heroic toy soldiers the Frost King had ever had; his mother had been the most beautiful and refined of the sugarplum fairies, back in the day when such titles meant something. Nowadays, fairies were usually found dancing on tabletops at Santa’s Grotto, wearing too much makeup and too little clothing. Those fairies who were lucky enough—not to mention pretty and daring enough—managed to get positions taking care of the Rein Dears. Now there was a position that had it all. Being a Rein Dear that is, not one of their fairies. It was no secret that some of the Rein Dears went through fairies the way Kringle went through cookies. Rumor had it the Rein Dears used their helpers for more than just helping, but no one dared challenge that. The Rein Dears were Mayor Kringle’s glamorous flyboys. They travelled the globe, delivering presents on Christmas Eve. If you were a Rein Dear, wherever you went, everyone loved you and worshipped you. Even the Mouse King and his hoods respected the Rein Dears. They were like shining stars. And Rudy…. Tim let out a wistful sigh. Rudy was the Squadron Leader, and the most handsome of them all. Big, strong, and in possession of the most amazing red hair anyone had ever seen. Boy, what Tim wouldn’t give to get caught under the mistletoe with him! He was also the only Rein Dear who didn’t have his own sugarplum fairy. No one knew why. There always seemed to be one or two hanging off his arm, but the pilot just didn’t seem interested in keeping any of them around. Either way, Tim kept his silly crush to himself. Even if he were special enough to be a Rein Dear’s helper, he wasn’t a sugarplum fairy and, therefore, not in possession of the correct enchanted chromosomes. Not to mention, he didn’t have much experience when it came to certain types of “helping.” He couldn’t even recall the last time he had been out on a date. A bell jingled noisily over his head, giving him such a start he lost his balance and toppled backward with the most embarrassing yelp. No amount of flailing kept him from hitting the floor with a painful thud. Could this night possibly get any worse? At least no one had been around to laugh at him. Then he remembered what the bell was for. “Plum pudding! The coal!” He scrambled to his feet and grabbed his jacket and flat cap before running as fast as he could down the silver marble corridor and out into the stairwell. By the time he reached the boiler room, the delivery driver was tapping his clipboard impatiently. “I’m here!” Tim called out from across the expansive warehouse as he caught up to the driver. “I’m sorry,” he wheezed, attempting to catch his breath. He really needed to cut back on the gumdrops. “Sign on the dotted line.” The disgruntled elf thrust the clipboard at Tim, who swiftly did as asked. When Tim looked up at the back of the truck, his eyes went wide. Before another word could be uttered, the stocky elf jerked a lever and the truck’s back door slammed open. Tim managed to jump out of the way in the nick of time, and stood speechless as the coal came barreling out, engulfing him in a cloud of black soot that sent him into a fit of coughing. It was no use. By the time the dust settled, the truck was gone, and Tim was left buried almost knee deep in a sea of coal. Picking up the receipt lying to one side, he scanned it for whoever was responsible for the order. Noel. He had done it on purpose. Tim sat down on the black lumps and bit his bottom lip, refusing to let any of his tears escape. That blasted Noel. What had Tim ever done to deserve this? He tried to think back, desperately searching for a time in which he might have mistakenly offended the supervising elf. Nothing came to mind. Tim had always been friendly with his coworkers, and worked very hard. In fact, despite Noel’s abrasive demeanor, Tim had always remained friendly toward him, hoping that Noel would see Tim held no grudges and merely wanted to get along. On several occasions, he had even offered Noel some of his cookies as a peace offering. That only seemed to annoy Noel even more. Tired of feeling so pitiful, Tim got to his feet and shuffled over to the rack of shovels. Grabbing the biggest one he could lift, he started the arduous task of carrying the coal over to one of the empty containers on the other side of the gargantuan furnace. By the time he was done, his entire body ached, and it was very late. Walking into the employee washroom, he stared at himself in the mirror. He looked like a little lump of coal, covered in soot from head to toe. As best he could, he scrubbed himself, thinking about getting home to a nice warm bath and letting the evidence of this rotten day wash away. After managing to get most of the grime off his face, neck, and hands, he removed his deep green vest, red tie, and what had once been a white shirt, staying only in his deep green knickerbockers and white undershirt. His white and red striped socks were ruined, as was the rest of his suit. That left him with only two suits. He had started the year out with four. Darn it. He just couldn’t afford to have any more ruined. He had already spent most of this week’s wages on his rent and the rest was for his meals. Well, he supposed he could get by on chocolate sandwiches if he had to, and he still had the cinnamon swirl truffles Mrs. Kringle had given him two weeks ago. Maybe he should think about a transfer, but was he really going to give Noel the satisfaction? Not wanting to think any more on the matter, he dusted his pants off, grateful he had left his jacket with his hat. At least he wouldn’t have to freeze on the way home. Having lived his whole life in North Pole City, cold didn’t bother him, so going out in the snow in a suit was fine, but going out in just your undershirt was a different matter. The last thing he needed was to catch a cold. Of course, there was nothing he could do about the state of his socks, so he would have to wear them as they were until he got home. He slipped into his jacket and secured his cap on his head before going out through the back of the warehouse. It was nippy out, but not too unbearable. His thoughts filled with images of himself sitting cozily in front of the fire with a hot cup of his favorite cocoa. He nearly let out a gasp but clamped a hand over his mouth just in time. The third elf was one of the Mouse King’s hoodlums, and he was handing over a parcel wrapped in brown paper to the taller of the toy soldiers. Jack Frost? Why would the toy soldiers want to hurt him? He was their chief, and the Frost King’s son. Surely, they wouldn’t…. This was bad. He shouldn’t be here. Tim took a quick step back and bumped into something hard, and when he turned around, he was stunned to find Noel there. Noel was clearly ready to chastise him, but Tim had no intention of sticking around. Whatever reprimand Noel had for him, it could wait until Tim was on the clock. He tried to get around Noel, who stubbornly tried to block his path, and in the process knocked over a trashcan. It crashed noisily to the ground, echoing all around them and bringing the three elves spinning toward them, their hands snapping to their coats. Holy Holly, they were going to shoot! Apparently this night could get worse.